Happy Wednesday! In the blink of an eye, we will be in the middle of the holiday rush. Can you believe it? Holiday parties will be on our calendars and our social lives will be filling up. Even if you only attend one Christmas party, Christmas gifts for the holiday hostess are essential. We can’t wait! One of the best things to do during this very busy time of year is to start shopping early. Like, today. As in, right now. It’s time!!!! If your hostess is a wine lover, I think the Nutcracker wine glass or the Corkcicle Air would be perfect! If your hostess has teenaged kids, the Christmas Cookie body wash and bubble bath (which my kids LOVE) or sequins Christmas stocking would be a hit. Does the hostess love rustic or farmhouse decor style? The cookie jar barn and barn cutting board are perfect for them. 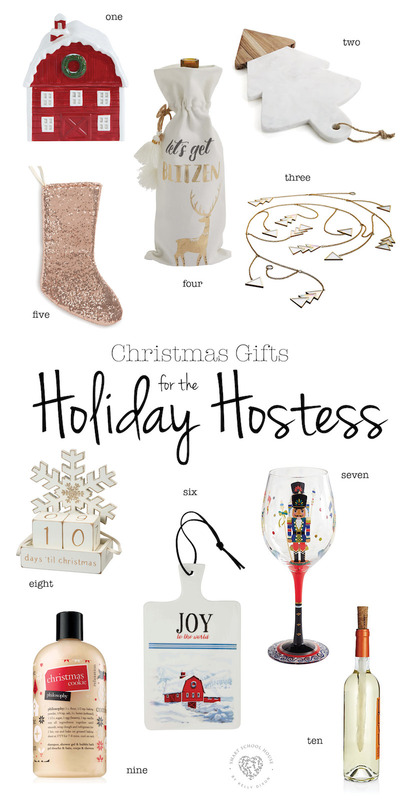 The chicest of hostesses would love the glass garland (how cool is that btw?) and the marble tree cheeseboard. Have more friends and family to buy for? Be sure to check out all of my Christmas Gift Guides here. You might also like all of my favorite picks (things I secretly love and selfishly want for myself).